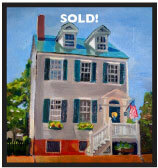 Ever thought of having a painting of your home? Whether it's an estate, cottage, barn, boathouse, new, old, the perfect color, or the house you grew up in, homes are special for many reasons? PAINTEDHOUSES began as a collection of colorful oil paintings. The framed 8 x 10 wood paintings originated as a selection of homes in a special Annapolis community on the Chesapeake Bay. Each home is painted on wood boards with a sturdy, stylish, black wooden frame. As word spread, I became very busy with commissions. I specialize in structures-houses, barns, boat houses. My paintings have a simple, colorful style, focusing on deep shadow and bright skies. I am always looking for a home that speaks to me, with the right light, color and composition, regardless of size or location. My background as a graphic designer helps me to see each structure as a form, and color helps to define the space. Of course each painting included a free set of notecards with the painted house on front. I had to find a way to include paper!